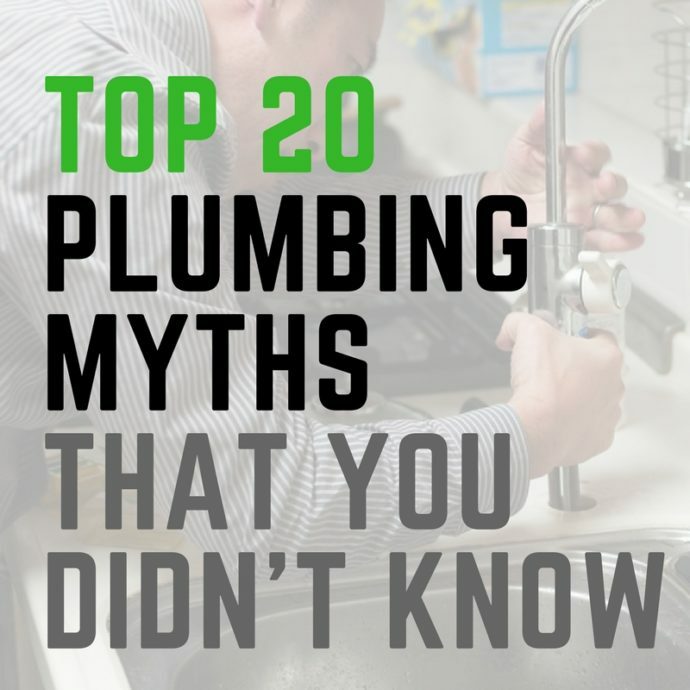 Not surprisingly, there are dozens of plumbing myths as well as myths about plumbers that have been swirling around since the invention of pipes, sinks and toilets. Consider some common plumbing myths you may have heard over the years. 1. A water heater that’s gurgling and bubbling is ready to explode. False. These sounds are caused by air popping due to sediment blocking the burner in the water heater tank. Residential plumbers have the training and experience to maintain water heaters as well as replace them when necessary. 2. Animals can’t enter your home through your toilet. False. Rats and snakes have been known to move through pipes finding their way up into a toilet bowl in a home or business. It’s not likely, but it has happened before! 3. It is safe to flush baby wipes if they claim to be flushable. False. Flushing one or two wipes may be okay, but too many wipes can create a stubborn clog in your pipes. If you flush several wipes during a day, there isn’t enough time for each one to disintegrate. Commercial and residential plumbers have the equipment to remove a clog of baby wipes that is deep within a pipe. 4. It’s safe to take a shower or bath during a thunderstorm. False. Lightning (electricity) can travel through the pipes in a home. Pipes made of metal are excellent conductors of electricity and the impurities in water can also help a current to travel. 5. It’s perfectly safe and effective to use a plunger on a sink clog. False. If you pour chemical-filled drain cleaner down your sink to clear a clog, you shouldn’t use the plunger on the sink. Plunging the sink can pull the drain cleaner up out of the pipe causing it splash and burn your skin. 6. It’s a good idea to clean and deodorize your garbage disposal with lemon peels. 7. It’s smart to put a brick in your toilet tank to save water. 8. A slow dripping faucet doesn’t affect the water bill. 9. Pouring hot grease down your sink is okay because it’s a liquid. 10. Attaching a bleach tablet to the inside of the toilet bowl is a good idea. False. A bleach tablet continuously releases bleach which can damage the surface of your toilet bowl over time. 11. Pouring boiling water down your pipes can remove a buildup of grease. False. It seems like boiling water would be able to melt the grease inside pipes, but it hardens the grease making it more difficult to remove. 12. Anything can go into your garbage disposal as long as you run the water at the same time. False. Some items of food such as celery, banana and potato peels can become stringy. Unfortunately, they can wind around the blades causing a malfunction. 13. Commercial drain cleaners are safe to use on a clog. False. Many of these drain cleaners contain chemicals that can erode your pipes causing more damage. Commercial plumbers have the know-how to safely remove the clogs in the pipes of a restaurant, store or other business. 14. Put ice cubes down your disposal on a regular basis to sharpen the blades. False. Put ice cubes down your disposal once every few months to clean the blades. Putting them into the disposal too often can dull the blades of your garbage disposal. 15. A leaky faucet can be ignored for a while without consequence. False. It’s best to conduct a search of residential plumbers near you so a simple leaky faucet doesn’t start affecting your water pressure or causing other issues. 16. Every plumber has the same credentials. False. This is one of those myths about plumbers. Not all plumbers have the same training and expertise. It’s best to check the credentials of a plumber before asking him or her to fix a problem. 17. If it disappears down the toilet, there is no issue. False. Just because an item like a wad of paper towels, a sanitary pad or a toothbrush disappears down into a toilet when it’s flushed, doesn’t mean it won’t cause problems later. 18. Flushing a goldfish down the toilet is always okay. False. If the fish is dead, then it is okay to flush it. The problem is that many people flush goldfish down the toilet thinking they are dead. A live goldfish can travel the sewer system and end up in a stream which alters that delicate ecosystem. 19. It’s okay to flush cat litter down the toilet. False. Cat litter contains cat waste which can travel through the sewer system and may cause toxins to spread elsewhere. 20. If the water drains out of your sink, there is no reason to call a plumber. False. If your sink is draining slowly, then you probably have a clog somewhere in the pipes that need to be removed before it becomes a bigger problem. Residential and commercial plumbers have the right training and equipment to remove stubborn clogs.